Issac Streetman and the Redneck Romeos will close out the 2016 Fourth Friday Summer Concert Series on July 22. 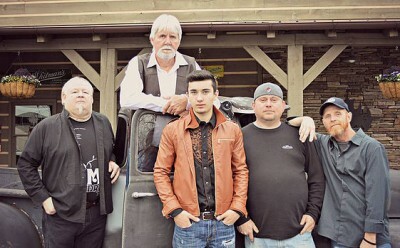 A local favorite, the Redneck Romeos will perform a mix of classic rock and country. The band will crank up at 7 p.m. but the event will start earlier with a classic car show hosted by the Throttle Jockies at 5:30 p.m.
Vintage cars will make their way down Main Street and line up near the courthouse. Music kicks off at 7 p.m. and runs until 9 p.m.
“We invite folks to bring a chair or blanket and set up in the greenspace on Main Street in front of the courthouse. They can wander around looking at cars, grab a bite to eat on-site and then head back to their spot to hear the band play,” Madden said. Rockmart’s Knucklehead Cafe will be on site with several food options along with beer. “We want these events to draw people out into the community so they can have a good time, listen to great music and get to know the folks in their city,” Madden said. Sponsors for 2016 include GEO Specialty Chemicals and The Polk County Standard-Journal, Waste Industries and Polk Medical Center. “These events would not be possible without the generosity of local businesses. We are so appreciative of their support,” she said. Sponsors for 2016 include GEO Specialty Chemicals and The Polk County Standard-Journal, Waste Industries and Polk Medical Center.